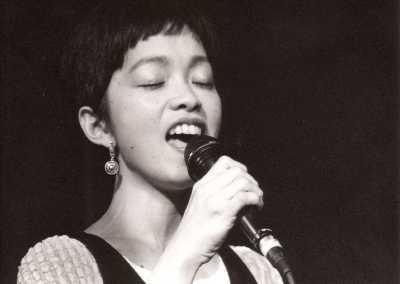 Peggy Chew is an Chinese-American jazz singer who breathes new life in the vocal jazz tradition with her modern sounds and songs. Her repertoire of American jazz, folk, pop, Brazilian and Chinese songs reflect her multicultural background and interests. She sings in English, Chinese, Portuguese and also improvises wordlessly. She has studied jazz vocals with leading American jazz singers: Jay Clayton, Anne Marie Moss (Manhattan School of Music), Bob Stoloff (Berklee College of Music), Norma Winstone and Lauren Newton. After living and performing in London, Spain and France for several years, she established her base in Switzerland. Soon she was a featured soloist with Vince Benedetti's Jazz Heritage Big Band, a member of its vocal quartet, a guest with various small jazz combos and a member of the acappella group "Three Voices and A Tuba." As a bandleader, Peggy has produced three CDs with the support of Swiss Radio DRS 2: "Detour Ahead" (Shaomei Productions, 1995), "Real Days" (altrisuoni, 2000) and "Sonic Calligraphy " (altrisuoni, 2004). The recordings were well received by critics in Switzerland and abroad. "Real Days" was honored as "A Selection of Swiss Radio International." An additional CD "Sonic Calligraphy The Flow of Things"(altrisuoni 2010) was recorded in Shanghai with two Chinese guest musicians, Shanghai jazz singer Coco Zhao and Beijing gu qin soloist Wu Na. Since several years, Peggy has been exploring her Chinese roots. "Sonic Calligraphy" is the outcome of this artistic journey. This program has been performed throughout Switzerland, in the USA (New York, San Francisco), in China (Beijing, Shanghai and Hong Kong) and in Brazil. Festival appearances: JZ Shanghai Music Festival, Culturescapes, Cully Select Jazz Festival, Zürcher Seenacht Fäscht, Jazz Nights Aesch, Jecklin "Red Note" Jazz Festival and altriusoni Jazz Festival. Peggy teaches vocal jazz at the jazz school in Basel.